After four seasons in which each British F3 Champion had progressed straight into F1, much was expected of the 1978 crop, led by Derek Warwick, the nearly man of 1977, and Brazilian Nelson Piquet Soutomaior. Warwick won four of the first five races in his 1977 Ralt RT1 but was then distracted by the 'opportunity' to try a March 783. By the time he returned to his Ralt, Piquet was on a streak of seven successive race wins and the BP title was lost. Piquet worked hard with engineer Greg 'Pee Wee' Siddle to develop the RT1 and had the edge on Warwick from then on but Warwick rarely finished lower than second and was able to wrap up the Vandervell title. Piquet kept up British F3's record by landing a F1 drive at Brabham. 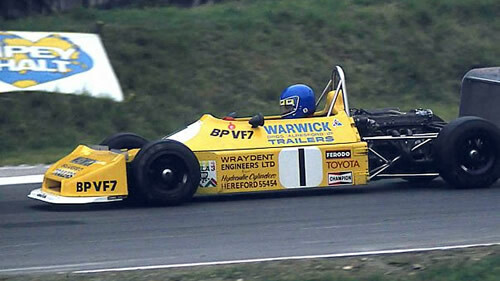 Warwick had to prove himself all over again in F2 before entering F1 with Toleman. The Ralt RT1 won 24 of the 28 British races. March couldn't get anywhere with the 783 and Chevron focused their efforts abroad, rewarded by winning the Monaco GP support race. Stefan Johansson was competitive with the new Argo JM1 and competent entries were made for Wheatcroft and Ehrlich chassis. The BP championship had 17 rounds and used a 9-6-4 points system with an extra point for fastest lap. The other BP round was the Monaco Grand Prix support race won by Elio de Angelis (Chevron B38-Toyota). This series ran over ten rounds and used a 20-15-12 points system with an extra 2 points awarded for fastest lap. Points tables from Autosport 23 November 1978 p32 and Autocourse 1978/79 p253. The Toyota/Novamotor continued to be the dominant engine with nearly 90% of the market but Swindon Race Engines had made a competitive proposition out of the Triumph engine for the two-car Unipart team. The only Ford engine to be seen was in Paul Dalton's antique Royale and and although Derek Lawrence perservered with the Chevrolet Vega engine, it's hard to see why. In France, Alain Prost had success with a works-supported Renault engine in his Martini MK21B and some of the German competitors, led by Bertram Schäfer, continued with BMW powerplants. The 1978 results have been compiled by Chris Townsend using the main British magazines Autosport and Motoring News . We are most grateful to Wolfgang Neumayer for chassis number observations of German and European-based cars at Monaco and Paul Ricard. Wolfgang's website http://formel3guide.de/ covers European and German F3 racing from 1948 to date. Race results are largely complete; there just being a handful of unknown results at 14 races. Qualifying results are also very nearly complete, the only significant gap being the times of the slower cars at Thruxton 29 May 1978. Entry numbers are nearly all known but copies of entry lists from race programmes for Donington Park 9 Apr 1978 (non-championship World Cup International F3 Race), Oulton Park 20 May 1978, Mallory Park 13 Aug 1978, Donington Park 26 Aug 1978 (Euro round), Brands Hatch 7 Oct 1978 and Mallory Park 15 Oct 1978 would be very useful. Identification of individual cars is quite good for this period as Chevron, March and Ralt production records allow a lot of the cars to be identified. Also it was common for Autosport and Motoring News race reports to mention former owners of second-hand cars and Autosport adverts as well as its 'Pit & Paddock' and 'Sports Extra' sections add further information on car movements.